I hadn’t had even my first cup of coffee yet, and my dog pawed at the office door, impatient to be fed and walked. But I was riveted by calm, sonorous voice of Svante Pääbo, a geneticist at the Max-Planck Institute for Evolutionary Anthropology and one of the team’s leading members, as he gave an overview of the project. “It’s extremely satisfying,” said Pääbo “that we now have the overview of the Neandertal genome after four years of intense efforts.” I can well imagine. As regular readers will know, I take an interest in Neandertal research, and I have written here and here on the ethical debate now stirring over possible future cloning of Neandertals. And it’s clear to me that this draft sequence of the Neandertal genome by Richard Green, a geneticist at Max-Planck Institute for Evolutionary Anthropology in Liepzig, Germany, and his large team, could supply vital information for those keen on replicating this ancient hominin. The genome consists of a complete blueprint for building a Neandertal. But the ability to clone an extinct human still lies far beyond us. Indeed, Science places this prospect today “in the realm of Sci-Fi.” I certainly hope so. More importantly for the moment, the new research tells us several important things about ourselves and our nearest kin, the Neandertal. At some point, very soon after Homo sapiens sapiens left Africa for the first time and landed in the Middle East, a few of the new arrivals interbred with local Neandertals, creating what geneticists call “gene flow.” As a result of these ancient liaisons, individuals of European and Asian descent today possess genes derived directly from Neandertals (as opposed to genes that we and our Neandertal ancestors both inherited from a common ancestor.) I and many others owe somewhere between 1 to 4 percent of our genome to a distant Neandertal ancestor. And here’s a second point. 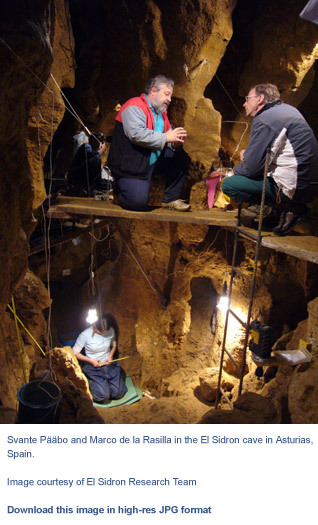 Green and his colleagues have started comparing the newly sequenced Neandertal genome to the modern human genome in search of key differences. They are looking for the things that make modern humans unique. Now clearly this is a monumental task, something that will occupy geneticists for a long time. But already Green and his colleagues have discerned a key disparity in a region of the genome involved in cognitive development.In other words, it looks as if our close kin, the Neandertal, learned to process information in a very different way than we do today. Sitting here in my office today, I can well imagine how this disparity may once have played out–in misunderstanding, hostility and confrontation between Neandertals and modern humans in the Paleolithic past. Lower photo of Svante Pääbo and the El Sidron Research team. Courtesy of Science magazine and El Sidron Research team. I left a comment on it that cloning Neanderthals was unlikely, and I felt that way due to lack of knowledge of the genome. So now that we have that, how likely is it that someone will try to clone a Neanderthal? I still think that it will be tried, and think it likely that the cloned Neanderthal will NOT be considered “human” but some sort of property. The Science magazine news bit says that it won’t be tried for “technical and ethical” reasons, but that won’t stop *all* scientists *everywhere. * For no particular reason, scientists are cloning woolly mammoths (according to the article), so I don’t believe that someone won’t try to clone a human or extinct human once we have the technical knowledge. That’s my reading of human nature, too. The vast majority of geneticists would eschew such a project, guided by their own personal ethics or by university ethics committees. But it would only take one or two rogue researchers to open Pandora’s Box. I have rather vivid memories of an illustration – probably from a National Geographic book – depicting a violent confrontation between one form of early hominid and another. While I believe that picture described much earlier species, I can imagine a Neanderthal/Homo Sapiens scrap being equally viscious, if not more so. Given our propensity for focusing on differences amongst our own species, I can just imagine how our homo ancestors must have felt about their “backwards” cousins. That being said, I suppose the fact that interbreeding *did* occur gives us some reason to hope for a less confrontational future along our line.